Researchers report our visual attention pays most attention to parts of a scene that have meaning to us, not the parts that stick out. Our visual attention is drawn to parts of a scene that have meaning, rather than to those that are salient or “stick out,” according to new research from the Center for Mind and Brain at the University of California, Davis. The findings, published Sept. 25 in the journal Nature Human Behavior, overturn the widely-held model of visual attention. Our eyes we perceive a wide field of view in front of us, but we only focus our attention on a small part of this field. How do we decide where to direct our attention, without thinking about it? Henderson called this the “magpie theory” our attention is drawn to bright and shiny objects. To make their meaning map, Henderson and Hayes took images of scenes, broke them up into overlapping circular tiles, and submitted the individual tiles to the online crowdsourcing service Mechanical Turk, asking users to rate the tiles for meaning. Conventional thinking on visual attention is that our attention is automatically drawn to “salient” objects that stand out from the background. 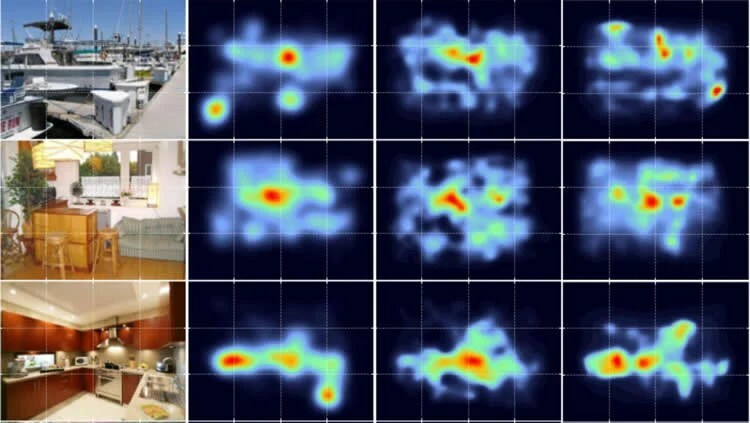 Researchers at the UC Davis Center for Mind and Brain mapped hundreds of images (examples far left) by eye tracking (center left), “meaning” (center right) and “salience” or outstanding features (far left). Statistical analysis shows that eyes are drawn to “meaningful” areas, not necessarily those that are most outstanding. NeuroscienceNews.com image is credited to John Henderson and Taylor Hayes, UC Davis. By tallying the votes of Mechanical Turk users they were able to assign levels of meaning to different areas of an image and create a meaning map comparable to a saliency map of the same scene. Next, they tracked the eye movements of volunteers as they looked at the scene. Those eyetracks gave them a map of what parts of the image attracted the most attention. This “attention map” was closer to the meaning map than the salience map, Henderson said. Although the research is aimed at a fundamental understanding of how visual attention works, there could be some near-term applications, Henderson said, for example in developing automated visual systems that allow computers to scan security footage or to automatically identify or caption images online. Funding: The work was supported by the National Science Foundation. Image Source: NeuroscienceNews.com image is credited to John Henderson and Taylor Hayes, UC Davis.